Journal of Photonics for Energy, 8(2), 022008 (2018). Progress in Photovoltaics: Research and Applications, 25 (11), pp 936-941 (2017). ACS Energy Letters 2 (2), pp 476–480 (2017). Le Yang, Maxim Tabachnyk, Sam L Bayliss, Marcus L Böhm, Katharina Broch, Neil C Greenham, Richard H Friend, Bruno Ehrler. Solution-Processable Singlet Fission Photovoltaic Devices. Nano Letters 15 (1), pp 354–358 (2015). Maxim Tabachnyk, Bruno Ehrler, Simon Gélinas, Marcus L Böhm, Brian J Walker, Kevin P Musselman, Neil C Greenham, Richard H Friend, Akshay Rao. Resonant energy transfer of triplet excitons from pentacene to PbSe nanocrystals. Nature Materials 13, 1033–1038 (2014). Tabachnyk, M.; Ehrler, B.; Bayliss, S.; Friend, R. H.; Greenham, N. C.
Triplet Diffusion in Singlet Exciton Fission Sensitized Pentacene Solar Cells. Applied Physics Letters 103, 153302 (2013). Ehrler, B.; Musselman, K. P.; Bohm, M.; Böhm, M. L.; Friend, R. H.; Greenham, N. C.
Hybrid Pentacene/a-Silicon Solar Cells Utilizing Multiple Carrier Generation via Singlet Exciton Fission. Applied Physics Letters 101, 153507 (2012). Ehrler, B.; Walker, B. J.; Böhm, M. L.; Wilson, M. W. B.; Vaynzof, Y.; Friend, R. H.; Greenham, N. C.
In Situ Measurement of Exciton Energy in Hybrid Singlet-fission Solar Cells. Nature Communications 3, 1019 (2012). Ehrler, B.; Wilson, M. W. B.; Rao, A.; Friend, R. H.; Greenham, N. C.
Singlet Exciton Fission-sensitized Infrared Quantum Dot Solar Cells. Nano Letters 12, 1053 (2012). Singlet exciton fission is the conversion of a single excited state in organic semiconductors into two excited states of lower energy. We investigate ways to use this process for higher solar cell efficiency. Moritz H Futscher, Bruno Ehrler. ACS Energy Letters 2, 2089-2095 (2017). Energy & Environmental Science 10, 509-515 (2017). ACS Energy Letters 1, 863-868 (2016). Luis M Pazos-Outón, Monika Szumilo, Robin Lamboll, Johannes M Richter, Micaela Crespo-Quesada, Mojtaba Abdi-Jalebi, Harry J Beeson, Milan Vrućinić, Mejd Alsari, Henry J Snaith, Bruno Ehrler, Richard H Friend, Felix Deschler. Science 351 (6280), 1430-1433 (2016). Perovskite semiconductors have recently shaken up the solar cell community because no other technology has ever seen such a fast increase in efficiency. We study the fundamental properties of these materials and devices thereof. Science 352 (6283), aad4424 (2016). Wilson, M. W. B.; Rao, A.; Ehrler, B.; Friend, R. H.
Singlet Exciton Fission in Polycrystalline Pentacene: From Photophysics Toward Devices. Accounts of Chemical Research 46, 1330 (2013). Marcus L Böhm, Tom C Jellicoe, Maxim Tabachnyk, Nathaniel JLK Davis, Florencia Wisnivesky-Rocca-Rivarola, Caterina Ducati, Bruno Ehrler, Artem A Bakulin, Neil C Greenham. Nano letters 15 (12), 7987-7993 (2015). Nathaniel JLK Davis, Marcus L Böhm, Maxim Tabachnyk, Florencia Wisnivesky-Rocca-Rivarola, Tom C Jellicoe, Caterina Ducati, Bruno Ehrler, Neil C Greenham. Marcus L Böhm, Tom C Jellicoe, Jasmine PH Rivett, Aditya Sadhanala, Nathaniel JLK Davis, Frederik SF Morgenstern, Karl C Gödel, Jayamurugan Govindasamy, Callum GM Benson, Neil C Greenham, Bruno Ehrler. The Journal of Physical Chemistry Letters 6 (17), 3510-3514 (2015). Demet Asil, Brian J Walker, Bruno Ehrler, Yana Vaynzof, Alessandro Sepe, Sam Bayliss, Aditya Sadhanala, Philip CY Chow, Paul E Hopkinson, Ullrich Steiner, Neil C Greenham, Richard H Friend. Advanced Functional Materials 25 (6), 928-935 (2015). Marcus L Böhm, René JP Kist, Frederik SF Morgenstern, Bruno Ehrler, Salvatore Zarra, Abhishek Kumar, Yana Vaynzof, Neil C Greenham. Advanced Energy Materials 4 (12), (2015). ACS Nano 9 (6), pp 5857–5867 (2015). Hoye, R. L. Z. .; Ehrler, B.; Böhm, M. L.; Muñoz-Rojas, D.; Altamimi, R. M.; Alyamani, A. Y.; Vaynzof, Y.; Sadhanala, A.; Ercolano, G.; Greenham, N. C. et al. Improved Open- Circuit Voltage in ZnO–PbSe Quantum Dot Solar Cells by Understanding and Reducing Losses Arising from the ZnO Conduction Band Tail. Advanced Energy Materials 4, 1301544 (2014). 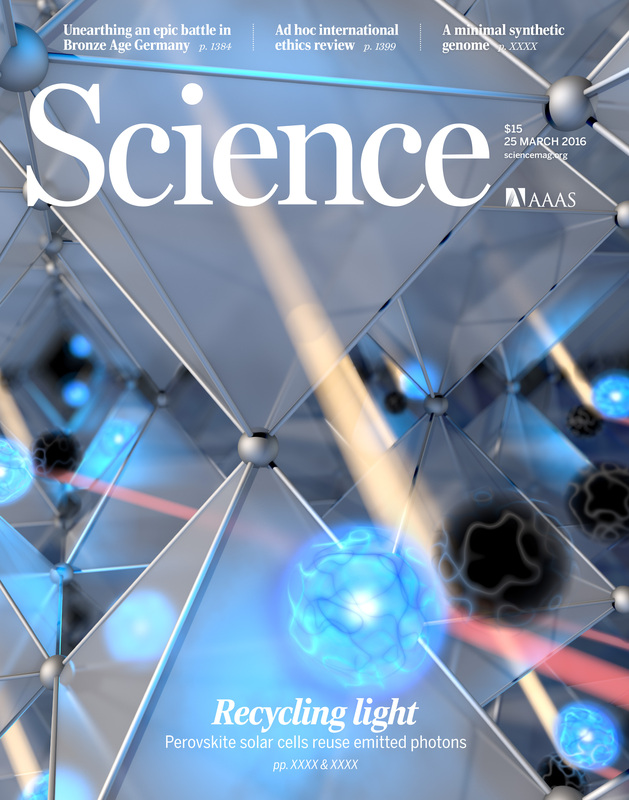 Ehrler, B.; Musselman, K. P.; Böhm, M. L.; Morgenstern, F. S. F.; Vaynzof, Y.; Walker, B. J.; Macmanus- Driscoll, J. L.; Greenham, N. C.
Preventing Interfacial Recombination in Colloidal Quantum Dot Solar Cells by Doping the Metal Oxide. ACS Nano 7, 4210 (2013). Quantum dots are highly tunable semiconductors with interesting properties. For example, their bandgap depends on their size, and they convert high-energy photons into multiple excitons. We study the physics of quantum dot solar cells. We are always looking for talented Master students to join our group!